The Concorde: Airport ’79 (1979) is the third sequel to Airport (1970), the only disaster movie to spawn its own franchise. Following the ‘bigger is better’ school of thinking, this installment features a faster plane and more mayhem than all the pervious films combined. Still, after nearly a decade, the formula has begun to wear thin, very thin. What it’s all about: Trouble for the supersonic passenger jet starts right away. A “radical” environmental group (really, is there any other kind?) hopes to prevent the Concorde from landing in Washington D.C. by floating a hot air balloon above the runway. First, what do they have against the Concorde? Second, how is a balloon going to solve anything? The jet could simply use another landing strip. Also, one would assume that the Concorde, which would begin its decent miles from the airport, would notice something as large as a hot air balloon blocking the runway. Evidently, common sense has been jettisoned in favor of high-flying high-jinks as the Concorde barely misses the intellectually challenged activists. Following the familiar disaster movie formula, we are next introduced to our all-star cast of characters. In the case of Airport ’79, the term “all-star” is very loosely defined. Concorde pilot Alain Delon romances stewardess Sylvia Kristel while Russian gymnast Andrea Marcovicci and reporter John Davidson engage in a hot-tub tryst under the nose of stern chaperone Mercedes McCambridge. It’s difficult to decide what’s funnier, her goofy Russian accent or the fact that McCambridge spends the entire movie dressed in a voluminous smock with a scarf tried in an oversized bow. A beret would complete the look of a chic Parisian artiste circa 1952. Avery Schreiber plays the Russian coach who travels everywhere with his hearing impaired daughter. This is where another disaster movie rule comes into play. The only thing better than a cute kid in peril is… a cute, handicapped kid in peril. A Harrison Industries whistleblower is shot in newscaster Susan Blakely’s townhouse. She escapes the same assassin by dangling from her rooftop high above the streets of Georgetown. The next day, Robert Wagner assures mistress Blakely that, as the president of Harrison Industries, he knows nothing about the illegal arms sales or the attempt on her life. As Blakely boards the Paris bound Concorde, the whistleblowers widow hands her the documents proving Wagner’s evil doings. Kennedy, as Patroni, has the dubious honor of appearing in all four Airport films. At least this time around, his character gets to fly the plane. In a nod to his Airport heritage, Kennedy made a brief cameo as a passenger in the flight attendant comedy View from the Top (2003). The wife of airline president Eddie Albert is played by Sybil Danning (Eva Gabor would’ve been a much better choice). Cicely Tyson accompanies a Styrofoam cooler containing a heart for her child’s transplant and Martha Raye plays a passenger whose only defining characteristic is that she has a bladder condition. With the incriminating documents in Blakely’s hands, Wagner does the only logical thing. He reprograms his experimental attack drone to target the Concorde. In a sequence that inspires giggles when it shouldn’t, the Concorde takes evasive action to avoid the missile. Military jet fighters eventually come to the rescue. With his first plan a bust, Wagner does the next logical thing. Using his French connections, he soon has his own jet fighter gunning for the Concorde. More slapstick mid-air acrobatics ensue. As the plane barrel rolls, the passengers are tossed about the cabin. It should all be terrifying, hair-raising stuff. Instead, it’s the goofiest and most unintentionally hilarious stuff in the entire series. Kennedy opens the cockpit window (!) and fires a flare in hopes of deflecting the heat-seeking missiles. When the gun jams, Delon shuts down the planes engines. That solves the missile problem, only now, they’re plummeting towards the sea. French air force pilots shoot down the fighter and the Concorde is able to restart their engines. Now there’s another problem. The reverse thrusters were damaged which means that they’ll have to land in Paris without any brakes! “You mean he’s not?” Bah-dum-bum. The saboteur panics after going through a standard security check and makes a mad dash through Charles De Gaul Airport. In an effort to escape, he runs out onto the runway where he’s nearly run over by the taxiing Concorde. While the Concorde comfortably cruises en route to the Moscow Olympics, the carefree passengers act as if the past 24 hours hadn’t happened. More chaos ensues when a preset timer opens the cargo bay hatch. At such a high altitude, the rapid decompression rips a hole in the bottom of the aircraft. Our heroic pilots must try an emergency landing in the Alps where the ski patrol has set up a temporary runway. As the plane shakes apart around them, Marcovicci and Davidson declare their undying love for one another and perform an impromptu wedding ceremony. Even the cold Russian heart of McCambridge melts at such a sight. “God bless you both,” she cries. Delon and Kennedy stoically attempt a landing, the Concorde skidding along the alpine pass. When the plane comes to a stop the ski patrol frantically try to dig out the passengers before the jet fuel ignites. Robert Wagner watches a live satellite TV report from the crash site where Blakely gives an audio account of the disaster. Realizing that the third time is not the charm and that Blakely must have nine lives, Wagner does the last logical thing, he shoots himself. Once the stars are free of the wreckage, the plane erupts into a ball of flame. 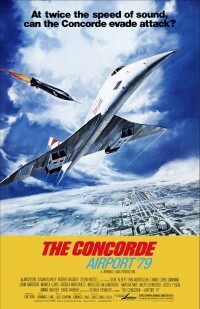 The final shot of the movie is of the Concorde flying majestically through the clouds, implying that the Concorde is indeed perfectly safe and that there may be yet another installment in the Airport series. In conclusion: Alas, some things aren’t meant to be. In 2003 the fleet of Concorde aircraft were decommissioned and there hasn’t been an official Airport film in over 35 years. The Concorde: Airport ’79 shows all the signs of a genre whose popularity had begun to fade. With a story that stretches plausibility paper-thin and a cast filled with actors of questionable star-status, this is one of the loopiest disaster flicks to come out of the 70’s. The four movies in the series are available on DVD as part of the 2-disc Airport Terminal Pack. This “franchise collection” is nicely packaged and features crisp widescreen prints of the films, but only the original Airport has remastered surround sound. The only special feature on each disc is a trailer. Where are the extended and deleted scenes? The trailer for Airport ’79 is a simple assemblage of scenes from the movie with no voice-over narration. What’s so strange is that it looks as if the studio purposely chose to showcase the most ridiculous moments in the movie. If the title didn’t come roaring across the screen, you’d swear you were watching a trailer for Airplane! (1980). Hmmmm, perhaps they realized that they had a comedy on their hands.